Limited Pre-Sales are now SOLD OUT and no longer available online. Tickets at the gate will be available for $80 cash, $82 credit/debit. Sacred Earth is created as a Cosmic Condensate in which our Music, Motion, Light and Love form a sacred structure in space and Time… a microcosmic celebration of the Infinite. We invite all to come dance, relax, join our community workshops and explore the wonder under the sun, moon and stars for 3 days and 2 nights. We provide 2 stages of sound and light, 525 acres of natural beauty for a weekend-long retreat in addition to a 5 acre spring fed lake, 2 campground areas in woodlands and meadows, running water, bathrooms, hot showers, and full vending. UPDATE 2:Workshop schedule has been announced! Click here! 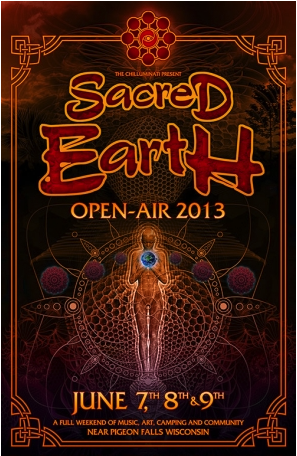 UPDATE:We are happy to announce that Sacred Earth Open-Air 2013 is an ALL AGES EVENT. Children under 12 are free with paying parent. All people under the age of 18 must be accompanied by an adult. As such, we expect our guests to help us maintain a family-friendly atmosphere at all times. You are responsible for your children at all times. Right of Admission Refusal in full effect. We plan to have activities for children during the day, and we’re open to suggestions! Stay tuned for more updates! WE PROVIDE:2 stages of sound and light, 3 days of camping in a beautiful natural environment (rain or shine), running water, bathrooms and hot showers, full vending (including alcohol for those 21+). YOU PROVIDE:a tent, enough food and beverages for the weekend (or some cash – food and beverages will be available for sale), NO GLASS, NO DRUGS, NO PETS, NO FIREWOOD (firewood can be purchased on-site). Please respect the venue by keeping the grounds free of litter. **This is a LEAVE NO TRACE EVENT** (yes, this includes beverage containers and cigarette butts!) Become part of the community. Help the planet, and help us. Pick up after yourself. Leave the site, and our reputation as a community, better than you found it. Fire– Deco in three Dimensions: Art, Light, Projection. As well as Fire and Kinetic performances. -Growth workshops; commune with your fellow psy-goers and learn something in the process! June 7, 8, 9 RAIN or SHINE; gate opens at NOON on Friday (no registrations can be accepted before that time). We’ve secured a beautiful, new venue located near Pigeon Falls, Wisconsin. Please help us respect the land, its owners, and the community by leaving the venue in the same (if not better) condition than we found it. Venue details will be released closer to the event. Sacred Earth Open-Air 2013 is *NOT* taking place at Camp NCN. Sacred Earth Open-Air is a LEAVE NO TRACE EVENT. Stay tuned to this page for final updates, directions, etc. If you’re a pre-sale ticket holder, watch your inbox for this same information.